Here I am in Orlando at the airport waiting for my friend and r oommate for the week to arrive. I wanted to share with you one of my favorite new sets out of the Spring/Summer catalog and some beautiful new Designer Series Paper, Rasberry Tart! What I really love about this paper is that you can use it with so many different colors of cardstock! We'll be off to check into our hotel, have dinner with some other friends, and then to get a good night's sleep so we are ready for check in day and make and takes tomorrow! I'll report in after we check in and get the NEW catalog!! Glad you arrived safe and sound, enjoy yourself and I will be waiting for updates. Oooooooooo... I am so totally jealous!!!!! You are going to have SO. MUCH. FUN! 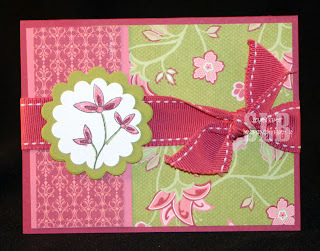 This is a gorgeous card--everyone will be fighting over it! Have a wonderful time!